There are certain artists who are immediately synonymous with a particular location. You think of Bruce Springsteen, you immediately think of New Jersey, and of the venerable, Stone Pony in Asbury Park, NJ; The Ramones, The Talking Heads, Television and Blondie should bring to mind the grittiness of the old, Lower East Side and of CBGB’s; Nirvana, Pearl Jam, Soundgarden and Mudhoney should bring to mind 1980s and 1990s Seattle, WA; and as soon as you think of the venerable Marsalis clan, you should immediately think of New Orleans. 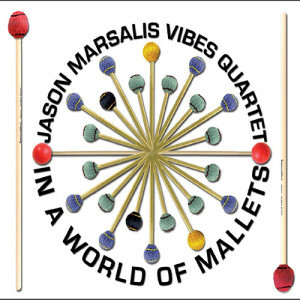 With the release of Jason Marsalis’s third album In a World of Mallets the youngest of the Marsalis clan returned to his role as composer and bandleader — and it served as the debut of the Jason Marsalis Vibes Quartet, featuring Will Goble (bass), Austin Johnson (piano) and David Potter (drums). 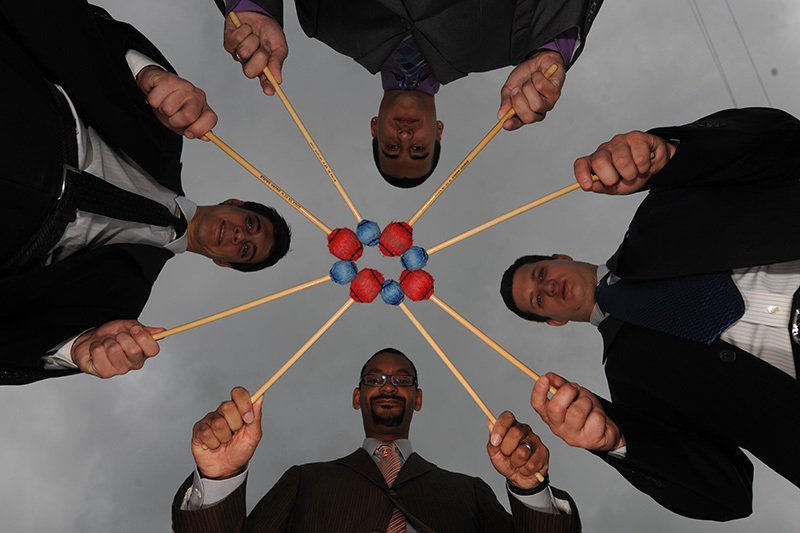 And what made that album interesting was that the album’s material was comprised of incredibly complex but playfully witty compositions which managed to twist, turn, dart, flit about and play with pauses, time signature changes and key changes in ways that put a modern twist on classic jazz. 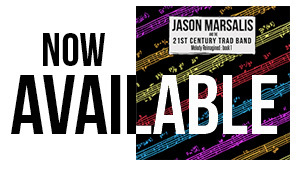 Basin Street Records will be releasing the second Jason Marsalis Vibes Quartet album, The 21st Century Trad Band on October 27, and with the release of the album’s first single, album title track, “The 21st Century Trad Band,” the album will continue to cement Marsalis’s reputation for playfully witty compositions that manage to be dense, complex and yet incredibly accessible. At one point, you’ll hear Marsalis playing the melody for “When the Saints Come Marchin’ In” for a few bars — right in the middle of the song that really swings and bobs with a sweet, amiable charm. This entry was posted in Press, Reviews and tagged Basin Street Records, Béla Fleck, Ellis Marsalis, In a World of Mallets, Jason Marsalis, Jason Marsalis Vibes Quartet, Joy of Violent Movement, Marcus Roberts, The 21st Century Trad Band, When the Saints Come Marchin’ In, William Ruben Helms on September 24, 2014 by abell. Marcus Roberts on piano, performing from his 1990 album “Deep in the Shed” in the Allen Room at Jazz at Lincoln Center. The album Marcus Roberts recreated from start to finish at the Allen Room over the weekend is 18 years old, but its mannerisms don’t come from any particular era. The key to “Deep in the Shed,” that record of six concisely written pieces in blues form, is its natural shuffling of elements from jazz’s entire life. It’s also one of the greatest cultural artifacts that owes its existence to Jazz at Lincoln Center. “Deep in the Shed” is a product of that organization’s artistic forces: Mr. Roberts started working with Wynton Marsalis’s groups in 1985 and shortly thereafter became one of the first important pianists in the Jazz at Lincoln Center Orchestra. The album wasn’t pedantic, explicitly connecting style X with style Y or pulling you through a chronological history of jazz. And it never became redundant either. It shifted keys and tempos, masked its blues form in the theme sections and could sound ancient — older than the Delta blues for instance — or modern. One thinks of it in the past tense. At the Allen Room the album was performed on Friday and Saturday, twice each night, in separate seatings. That allowed about 2,000 people to hear its music in total. But for now its rediscovery will be limited. The album is out of print, which is strange; it’s not a record that should be shrugged off. The playing in Friday’s early set, by a nine-piece band with only one of the album’s original musicians — Wessell Anderson, the saxophonist — was a little restrained, but the beauty of the compositions came through clearly. There were Ellington-esque saxophone voicings, rhythm-section passages that suggested the John Coltrane Quartet, and semi-Arabic scales. Each piece was carefully arranged and packed with incident and contrast. Sure enough, the “E. Dankworth” performance had a lot more than the trumpet solo. It’s a fast piece, but Mr. Roberts played sparely and without post-1960s harmonic clichés. The two tenor saxophonists, Derek Douget and Stephen Riley, alternated 12-bar stretches with wildly different tones — one honking, one mentholated. Jason Marsalis played a drum solo of immaculate logic, pumping the bass drum on every beat, then layering rhythms on top. Roland Guerin performed an unaccompanied bass solo, plucking and slapping. Finally came Etienne Charles’s trumpet solo, which didn’t have the bravura or momentum of the original but had strength and a clear, almost classical sense of thematic organization. Mr. Charles, in his early 20s, was a student of Mr. Roberts’s at Florida State University; the other young trumpeter onstage, Alphonso Horne, bore a deep Wynton Marsalis influence. This record, and this way of playing jazz, still has repercussions, and the show was a good example of how Jazz at Lincoln Center — in the near-total absence of a jazz vernacular or a jazz-record business — has set itself up to cultivate, manage and amplify them. This entry was posted in Press, Reviews and tagged Allen Room, Alphonso Horne, bass drum, Ben Ratliff, blues, chronological history, Deep in the Shed, Delta blues, Derek Douget, Duke Ellington, E. Dankworth, Etienne Charles, Florida State University, Jason Marsalis, Jazz at Lincoln Center, Jazz at Lincoln Center Orchestra, jazz history, John Coltrane Quartet, Lincoln Center, Los Angeles, Marcus Roberts, modern blues, New York Times, NY Times, out of print, Press, Roland Guerin, saxophonist, Stephen Riley, trumpet solo, Wessell Anderson on February 6, 2013 by abell.